You know those stick-figure memes that end with some iteration of “Don’t be like Joe”? Joe wants to rule the world. Joe works 20 hours a day and sleeps 4 hours a night. Joe is forever tired and cannot function at his best. Joe fails to execute the “next big thing” and loses a boatload of money. Joe learned the hard way that good sleep equals good productivity. While you might be tempted to go at it 24/7, especially when you first start a business or are climbing the corporate ladder, don’t sacrifice sleep along the way. That won’t do anything but waste effort and time, and then waste resources as a result. A 2016 study by the RAND Corporation found that sleep deprivation among American workers costs the U.S. economy upwards to $411 billion every year. Do I have Joe’s attention yet? In the business world, you have to operate on the attack as much as possible—attacking problems, finding solutions; attacking challenges, creating new ways to exploit them. That requires your body and mind to be in tip-top shape. Vicki Culpin, a professor at the Hult International Business School in Cambridge, Mass., studied the phenomena in 2016, looking at 1,000 workers at all levels of their organizations. The study actually calls sleep deprivation “a hidden threat” to businesses the world over. Without the right amount of sleep—the Centers for Disease Control recommend 7-8 every single night—you compromise your body’s ability to both function and heal itself. You are a resource within your company. You waste that resource when you’re tired at work. When you don’t sleep enough . . .
● You undercut your own cognitive performance—memory, problem-solving, attention, etc. ● Your blood pressure rises; your heart works too hard. ● You’re less able to fight off illness. ● You get cranky because you are less able to cope with challenges. Let’s not underestimate the importance of civility in business transactions and relationships on that last point. Among the many things that they don’t teach in uni or your MBA program are skills like teamwork, humility, patience, resilience and gratitude. All of those things are tied to your ability to listen, adapt, solve problems, deal with colleagues and contacts empathetically. All of those things are also made infinitely more difficult when you fail to get enough sleep. When you can get regular, restful sleep, you can work at a high rate of productivity. That’s because your body and mind do incredible work during slumber. Your heart rate drops, which gives your cardiovascular system a rest. Your immune system ratchets up its work, releasing hormones that repair body tissues. This 2013 study from the National Institute of Health even found evidence that vaccines work better for well-rested people than for people suffering from sleep deprivation. Also, as you sleep, your brain reaches a relaxed, fluid state where it easily flows through problems and solutions. The old adage, “Sleep on it” because the answer will come to you overnight, holds up to scientific scrutiny. Most of us think we know how to sleep. We are born into this world knowing how to sleep. But the needs of your body and mind evolve over time. Consider attacking sleep deprivation as you would any business conundrum: Make a plan. Certain physical things that sleep-deprived people complain about—pain or numbness in limbs, lots of tossing and turning trying to get comfortable, trouble shutting down—can be attributed to the environment in which you sleep. Even your mattress can be a culprit. That is what 20-30 percent of patients, who complained about waking up in pain, said to their chiropractor named Dr. Dominique from Alpine Chiropractic in Colorado. Should you buy a new mattress because you can’t sleep? Maybe. What seems like an extravagant purchase, may be a good investment in your health and productivity. When you find yourself staring at the ceiling, unable to wind down, DO NOT PICK UP YOUR PHONE. The blue light emitted from electronic screens stimulates your brain. It makes it harder to relax. Stop using them an hour before bedtime. Move the TV into another room and pick up a book. Reading does a better job of helping you wind down. It is estimated that one-third of all Americans are sleep-deprived. A doctor can help you untangle the mystery of whatever is keeping your up at night. We all know when we’re at our best—synapses are firing, juices are flowing and you complete tasks in good time. You’re brutally efficient and highly productive. While you might be tempted to sacrifice time doing other things—relaxing on vacation, visiting family, pursuing a hobby—you shouldn’t sacrifice sleep. You’re not losing time when you sleep. You are priming your body to be productive and successful. 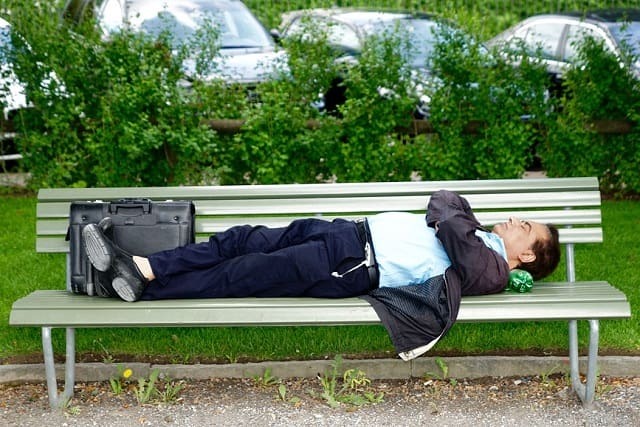 Bosses should stay vigilant about getting sleep and making sure employees do the same. Your bottom line is at stake. I hope you enjoyed this article about why getting more sleep means you will be more successful at work throughout your career.